Simon is an Advocacy Writer at Waterkeeper Alliance, the largest and fastest growing nonprofit solely focused on clean water. Reposted with permission by Waterkeeper Alliance. The system is cheap for producers, but it costs North Carolina an uncounted fortune: Toxic emissions from industrial hog operations foul our air; contaminants from the operations pollute our waters; and neighbors of its industrial operations live shorter lives. 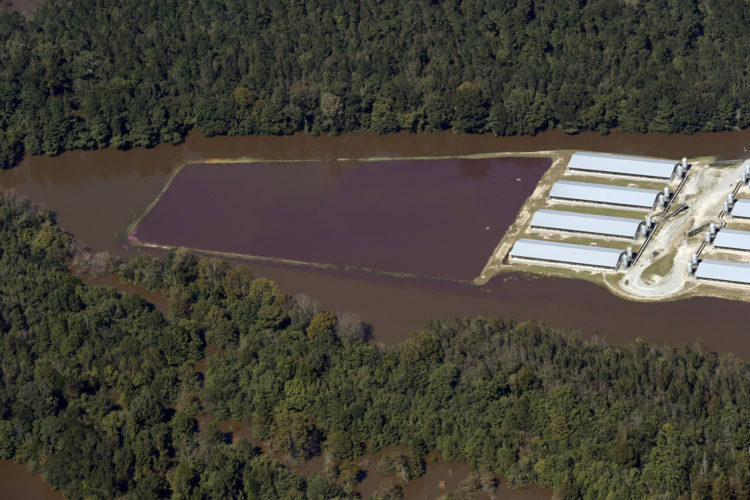 Broadly, we’d like to see Smithfield Foods and other pork giants, which make hundreds of millions of dollars from North Carolina, shoulder responsibility for managing the waste produced by the animals they own. In the current system, that responsibility primarily falls on contractors, many of whom carry debt they incurred when they invested in the infrastructure these pork giants demanded to house their hogs. If you live in North Carolina, you can join us in demanding more transparency and more pollution controls. You can speak up for North Carolina’s creeks, rivers, and lakes. You can speak up for hog farms’ neighbors. The state’s Department of Environmental Quality scheduled the first public meeting to take place in Greenville on Oct. 4. Then, after Hurricane Florence, the agency rescheduled the Greenville meeting for Nov. 27. On Nov. 15, the parties to the civil rights settlement met to discuss the agency’s compliance with the agreement. When confronted with its commitment to hold a meeting in one of the counties most affected by swine production, the agency chose, instead of holding a second meeting, to announce a late-day switch, keeping the date for the public meeting, but moving it to a different location, in Sampson County. The meeting is now scheduled to take place at the Sampson County Exposition Center, 414 Warsaw Rd., Clinton, N.C. 28328. The meeting will be held Tuesday, Nov. 27, in two sessions, one from 9 am to 4 pm and another beginning at 6 pm. During the first session, stakeholders will rotate between five areas designed to solicit technical comments on sections of the permit. During the evening session, those technical comments will be summarized and input on them will be solicited from the public.